Editorial: Santa Ono’s social media presence is blurring with university policy. That’s a problem. On May 29, Ubyssey editors contacted UBC Public Affairs asking for a statement on what, if anything, UBC was doing to secure the just treatment and release of alumna Loujain Al-Hathloul, currently imprisoned in Saudi Arabia for her activism for women’s rights. Minutes later, we received a phone call from Public Affairs with a message: Santa Ono was about to tweet. We were understandably confused. Twitter is not usually the place to make policy statements — at least, not for our president. 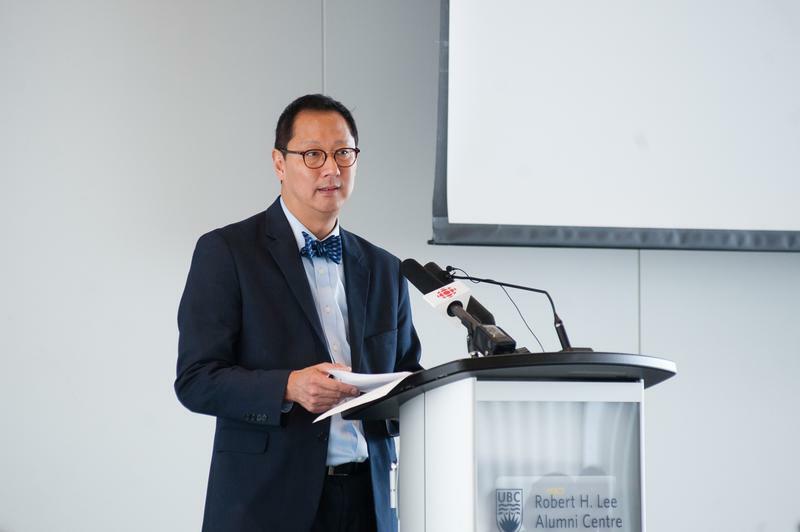 Sure enough, Santa Ono tweeted a two-part statement from @ubcprez, which was deemed to be “not sufficient” as well as “strange and tepid” by faculty members who started the letter campaign to call on UBC to make a statement of its own. He followed that with another response the same night, but it was not until the next day that he delivered a forceful statement that satisfied them. It was yet another case of how UBC’s president has used social media as an extension of his office — and another example of how it has backfired. Santa Ono’s social media presence is well-documented. When serving as president of the University of Cincinnati, he gained popularity and praise from students for his adept use of the medium. He’s quickly applied the same techniques here at UBC, paying special attention to a curated — if not overactive — Instagram, never shying from a selfie and even posting pictures of dogs to Facebook. Since well before this incident in particular, Ono has also been using his personal Facebook account to interact with students and comment on current events. 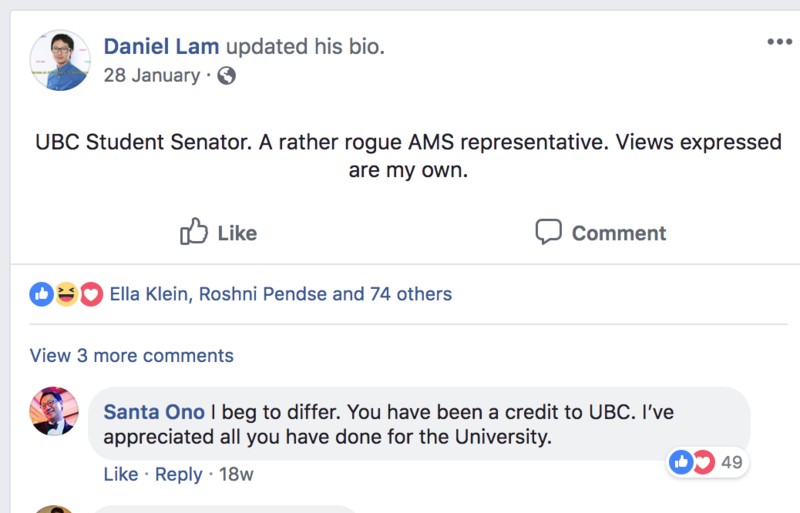 When The Ubyssey released emails showing that UBC senior administration had referred to former AMS VP Academic and University Affairs Daniel Lam as a “rather rogue AMS representative,” Ono commented on Facebook to assure Lam he appreciated his work. Most recently, following The Ubyssey’s publication of “One Year Later,” a three-part series on the botched implementation of UBC’s sexual misconduct policy, Ono jumped in on a Facebook post by AMS VP Academic Max Holmes to thank the various student leaders who have helped shape better policy around sexual misconduct. Except, as former AMS VP External Kathleen Simpson aptly pointed out, he forgot to mention the women student leaders who have contributed to the policy and its implementation. All of them. Ono quickly backpedaled, copying and pasting Simpson’s correction without adding anything of his own— and without addressing the questions raised by the series, for which he only provided a brief statement through Public Affairs. No one’s mad if Santa Ono likes dogs and wants you to know about it. There’s nothing wrong with being approachable and recognizable to the students you serve. But Ono’s media presence has begun to bleed into his office, and vice versa. At this point, it’s unclear what separates a random Twitter thought or a kind comment on Facebook from an official statement on behalf of a university of nearly 62,000 students, staff and faculty. That opens him up to blunders, intentional or not, that make the line between policy and post terribly ambiguous. He should take his own advice.